A rustic Italian roasted tomato soup recipe made with the last of summer’s heirloom tomatoes, slowly roasted with garlic, onions and a splash of white wine! 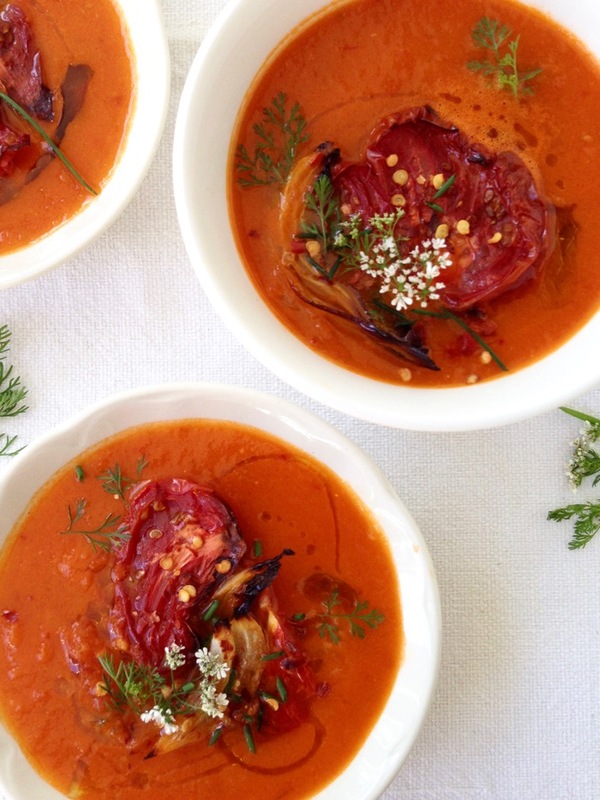 This roasted tomato soup recipe kids, ahhh! But before I even dive into telling you about how I could eat this each day every day, spring, summer, fall and winter until the end of time, I’ll rewind a little to explain how this actually came to be. To make my recipe make some sense, you’ll need to rewind a couple of weeks back. My local Sprouts Farmers Market had the greatest organic heirloom tomato sale of all times. We ended up with about 35 pounds of heirloom tomatoes at the shack, yes you read that correct, 35 pounds of tomatoes at $0.98 /lb. Incredible, i know ! So we’ve been living on all things tomatoes: like this cucumber tomato salad, this bruschetta panzanella salad, and lots of fresh tomato salsa. Plus a few bowls of this fresh tomato basil capellini with lots of garlic and jumbo shrimp for Sunday dinner. 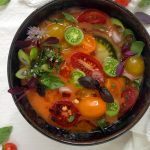 Finally this heirloom roasted tomato soup recipe livened up by a sprinkling of fresh herbs from the garden also happened! 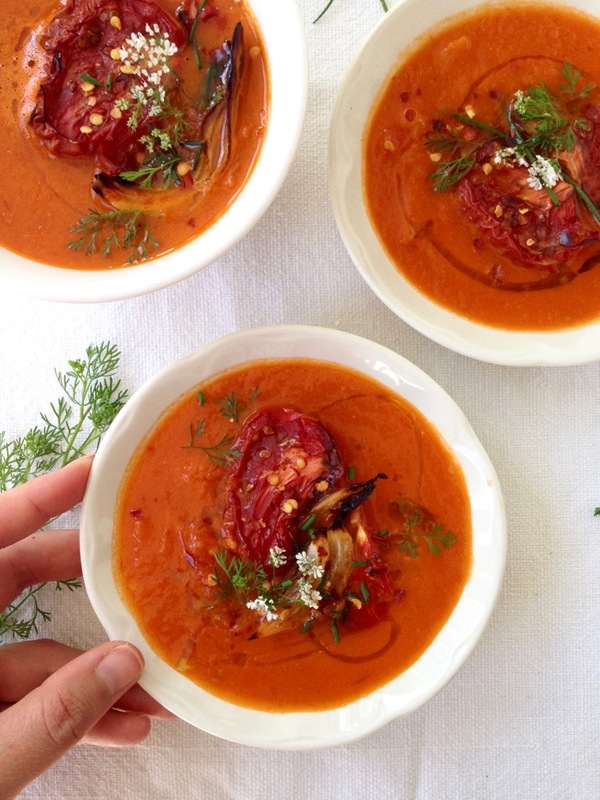 This roasted tomato soup recipe is something I would usually make right around the beginning of fall, with the last of summer’s tomato harvest. But I had this one last box of extra ripe tomatoes sitting on my kitchen counter, and I simply could not resist. In the fall I would typically make it just as my grandpa would, roast everything at very low heat for the entire day and make the house smell like a small Tuscan town on a chilly winter day. But it’s been so warm for us in California and I just could’t have that oven going for that long, right ? Actually two and a half hours turned out to be just what those tomatoes needed to collapse and concentrate their flavors, and also get just enough caramelization around the edges to give this roasted tomato soup recipe that homey comforting taste. 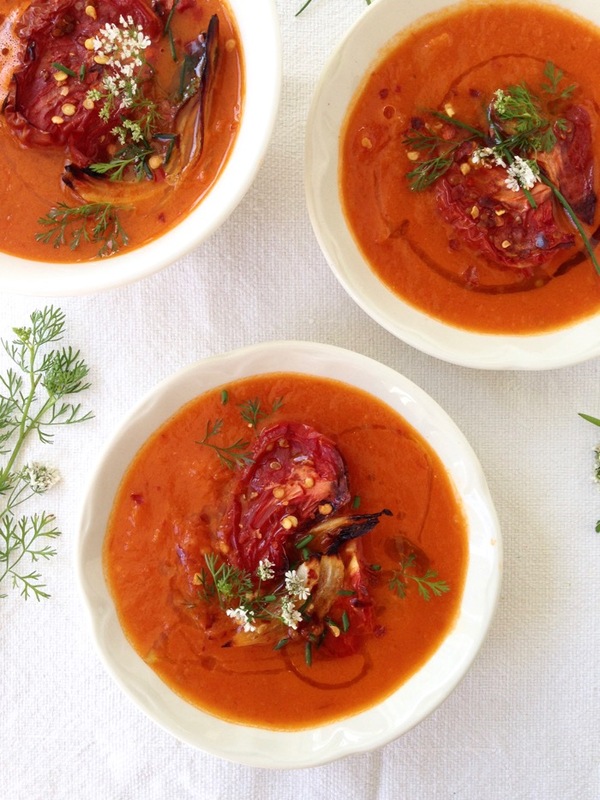 It is the simplest, easiest tomato soup you’ll ever make, not to mention healthy! Everything roasts together with some white wine and fragrant thyme, then gets blended together into a rustic soup and garnished with your favorite herbs. I think it goes without saying, but once you make this you’ll never want tomato soup out of a can ever again. A rustic Italian roasted tomato soup recipe made with the last of summer's heirloom tomatoes, slowly roasted with garlic, onions and a splash of white wine! Preheat oven to 350”F. Meanwhile cut the tomatoes and onion into wedges then add them to a large roasting dish, together with the garlic cloves and thyme. Drizzle all over the top with the olive oil and sprinkle with the sea salt. Roast in the preheated oven for 1 1/2 hours. Pour the white wine over the tomatoes and roast another hour or so, until the liquid is almost evaporated and you can see nice caramelization around the edges.Discard the thyme. Transfer the roasted tomatoes, onions, garlic together with all the juices to a medium soup pot. Reserve a few tomato slices and caramelized onions for garnish if desired, then pour in the vegetable stock and bring to a gentle simmer. Remove from flame and using a hand held blender puree the soup to your liking. Adjust seasonings to taste with more sea salt and red pepper flakes. Serve hot garnished with the reserved roasted tomato wedges, the herbs and a nice drizzle of extra virgin love oil. Play around with the final texture of the soup, adding more stock as desired to reach your ideal consistency. Ajiaco Cubano is my fave! hearty and filling! My favorite soup is Italian Wedding Soup! My favorite soup is beef vegetable! I do also like a chunky tomato soup with fresh basil, but beef veg beats that out by just a bit! My favorite is Potato Bacon Soup. My favorite soup is my Homemade Vegetable Soup. My favorite soup is Lobster Bisque or Tom Kai/ It is a toss up. I love Vegetable Soup. I like it either with Beef or without. Cream of broccoli is my favorite soup. Currently we are having fun exploring soups with cauliflower. Broiled and pureed. Minestrone! Good hot or cold! Filling and healthy. I am a big fan of Italian Wedding Soup! And I also love broccoli cheddar soup! My mom’s autumn vegetable soup! my favorite soup is rice soup. Mom does a great potato & leek soup to die for! I love Minestrone! But I am a serious Soupaholic LOLOL! I love hearty soups like this one but also love creamy ones…depending on my mood!!! This would be hard for me to answer, I like lots of soups. This tomato soup recipe looks awesome. Miso soup is my favorite. 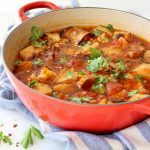 I like a tomato based veggie soup–loaded with just about any vegetables and beans with tons of garlic. Anything hardy – from potato, French onion, or a spicy chicken tortilla soup! My favorite soup is tomato or bean. My favorite soup is tomato & rice. my favorite soup is a fiesta tortilla soup,I love my food spicy! My favorite soup is roaster red pepper and tomato. My favorite soup is Vegan Lentil Soup! My favorite soup is home made vegetable or wild rice and chicken soup. I love chicken & wild rice soup. I have many favorite soups. It’s had to chose just one. I’ll say probably beef vegetable soup would top my list right now. My favorite is potato soup. My favorite soup is loaded potatoe soup!!! My favourite soup is Tomato Rice. My favorite soup is Chicken Tortilla Soup, but it’s so hard to find a good recipe. I love a good tomato bisque. My favorite soup is my daughter’s homemade bean soup. I brought my friends via FB and twitter, but it’s not giving me the ten extra points! Help! It should be in the raffle copter counter automatically, I’ll make sure all your entries are registered. I love soup , pumpkin soup is my fave. Thats a tough one……………I love so many but if I had to pick one I would choose Split Pea with ham. Cream of cauliflower soup is my favorite. Unfortunately, this comment will be my only entry into your giveaway because I don’t have a google+ account. Too bad that’s mandatory for opening the Rafflecopter. My favorite soup is potato chowder. My favorite type of soup is beef soup! So delicious! 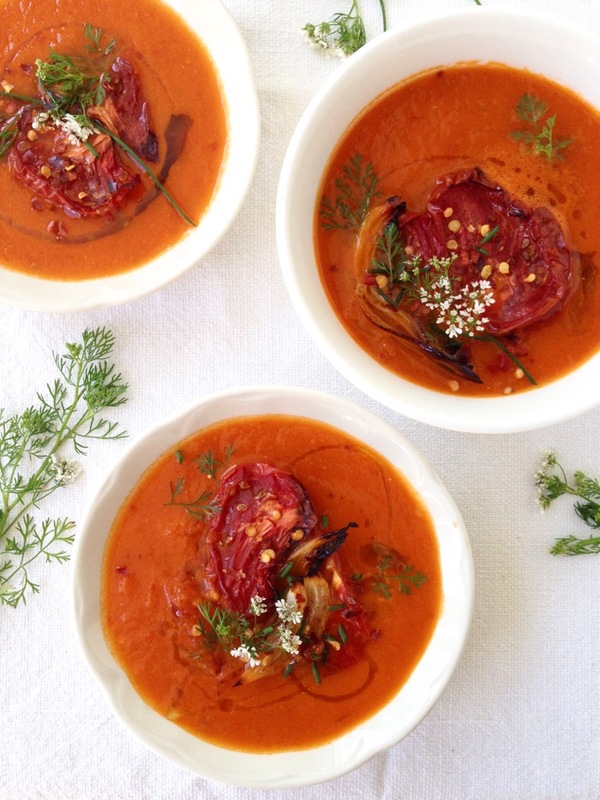 My favorite soup is Italian Wedding Soup, but this roasted tomato sounds delicious! I think I’d garnish with a blop of plain, Greek yogurt. Homemade Vegetable Soup is my favorite. My favorite soup is potato and and bacon. Thanks for this giveaway! tough question because i love soup! french onion probably tops the list! I love creamy tomato soup and French onion soup. Chicken Enchilada Soup is my absolute favorite! Florentina, I love tomatoes and come summer, that’s nearly all I eat. This looks absolutely amazing. Thank you Kristi ! Don’t you feel amazing tough on a tomato diet ? I can do tomatoes every meal ha! I just made soup tonight! It was a yummy sausage, white beans and spinach soup. I love all soups, but lean toward the hearty and thick variety. I love roasted tomato soup. I cut mine in half and roast them cut side down and then the peeling slides right off and then it’s nearly soup. I really like you recipe. 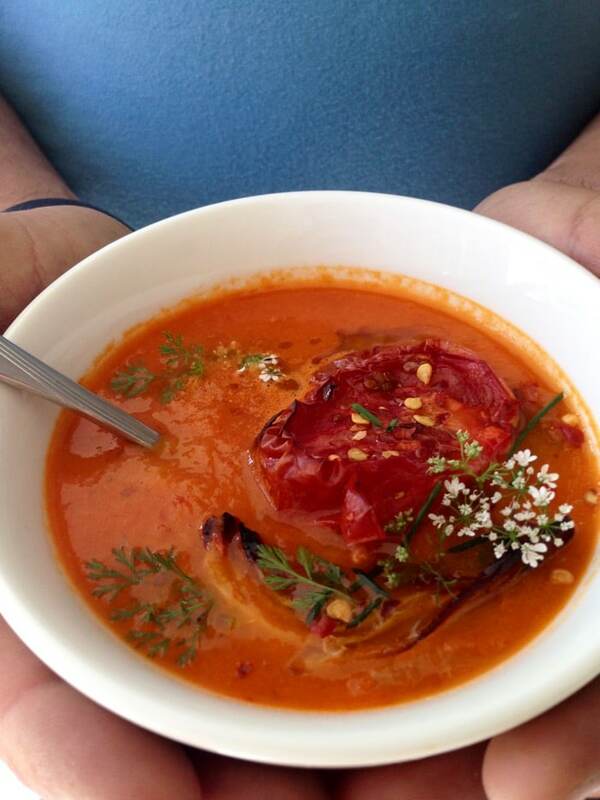 Florentina, your soup looks like a work of art, summer in a bowl! So pretty! This may become a new fave! Although currently I can’t pass up a bowl of French Onion soup. I do love soup! Vegetable soup with meat is my favorite. My favorite is broccoli cheddar! My favorite soup is french onion soup. I like loaded baked potato soup. Chicken Rice Soup is my Favorite. These are Beautiful Salt & Pepper Shakers. My Grandmother passed down many sets to me which started the Collection I have now of 120+ sets of Salt & Pepper Shakers. Would love to add these!! Wow! What a legacy ! I bet it’s a beautiful sight ! French Onion Soup. So very delicious. My favorite soup would have to be corn and potato chowder. Ah!! another who likes French Oxtail. I make a spatzel to serve with this. Every so yummy. My favorite is home made green pepper soup. Thank you for the chance. Asparagus soup is one of my favorites but it has to be made correctly! Beef stew with potatoes and mushrooms. My favorite soup is clam chowder, the New England kind. Good old and still the best: CHICKEN ! My favourite soup is mushroom! MY GRANDMA’S SOUP IS MY FAVORITE SOUP. My favorite soup is White Bean Chicken Chili Soup. 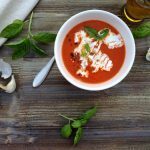 Tomato soup is my favorite and this recipe looks amazing!! One of my favorite soups is a coconut red lentil. My favorite soup is cream of mushroom. Although I make a terrific vegetable soup, my favorite is a creamy mushroom soup!! Oh My…. I dont think I have ever seen such a delightful looking tomato soup. My favourite soup is pumpkin with a hint of ginger, and french onion. Mmm! My favorite soup is a potato soup I make with ham and mushrooms. French Onion is what I love to eat! 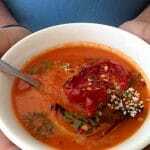 Tomato basi is my favorite soup. My favorite soup is hot and sour soup! I love soup, but any homemade soup does it for me! My favorite to eat and make is a Portuguese Bean soup. My firend gave me his grandmother’s recipe, and it’s phenomenal! French Onion w/ Sour Dough floating on the top & Melted Swiss Cheese!!!!! Chicken tortilla soup is my favorite. I’m a Minnesotan, so I have to go with Wild Rice soup! yum! I make a soup that has yellow squash, potatoes, carrots and cheese and is pureed. It is our favorite. My favorite soup is Pho I make my own at home, I also make a pretty good chicken and dumplings. I like Persian barley soup. When (what stage do you remove the tomato seeds?) This look wonderful; I cannot wait to try this. Hi Lynn, I do not remove the tomato seeds,ever. I feel you lose way too much of the tomato to be worth it, plus since you puree the soup you’ll never even know they were there. I hope you give this a go, one of my favorite soups. Have a great weekend ! Can you can this? It looks delish and I would love to send up to my daughter in college. 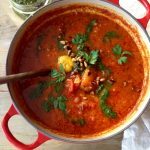 It’s nearly impossible for me to narrow down to one favorite soup; this roasted tomato soup that you have put together looks as tasty as any I’ve ever seen! I have made homemade tomato soup from both canned tomatoes and roasting fresh in the oven this way. I have to be honest, I did not find roasting tomatoes made much of a difference much to my surprise. And…it is a lot more work to roast tomatoes.